Some of the greatest HBCU basketball players of all-time never made it to the NBA. You gon’ learn today. The NBA’s regular season kicks off on Tuesday night, which is akin to a holiday for a lot of folks. While the official start of college basketball is a few weeks away, we thought it would be nice to take a look back at some of the HBCU hoops legends who never played in a regular season NBA game. A native of New Bern, North Carolina, Jackson grew up in Brooklyn where his family relocated as part of The Great Migration. His high school teammates included Connie Hawkins and Lenny Wilkins and he spent his time giving pros like Wilt Chamberlain the business at Rucker Park. When it was time to play college ball, Jackson headed back down south, playing at Virginia Union University. At 6’5, Jackson was an undersized center even by his time’s standards, but it was his leaping ability that made him a feared defender and force down low, earning him the nickname “Jumping” Jackie Jackson. Drafted by the Philadelphia Warriors, Jackson went on to play 20 seasons with the Harlem Globetrotters. Probably the most familiar name on this list, at least for casual basketball fans. Kirkland honed his skills on the streets of Harlem as a kid, both on-and-off the courts. He started off at Kittrell Junior College in North Carolina, where he led the nation in scoring. He ended up at Norfolk State College, running the show for Ernie Fears’ run-and-gun team that routinely averaged better than 100 points per game despite the absence of a 3-point line. His most famous game was the 1968 CIAA Championship in Greensboro where he led his team to a triple-overtime win over hometown favorite NC A&T. Kirkland would go on to be drafted by the Chicago Bulls but never played in the NBA as he chose a more-lucrative life of crime. That would eventually lead to prison time, but ultimately Kirkland turned his life around and has been mentoring kids for the better part of 30 years. Texas Southern has had a lot of talented players wear its uniform, but none were as prolific as the man they called “Machine Gun.” The Jackson, Mississippi native was a scoring machine during his time at TSU (1979-83). Averaging just under 28 points per game (again, with no 3-point line), he is one of the leading scorers in NCAA history with 3,066 points. He also grabbed better than 1,000 rebounds in his career. He would go on to be selected in the fourth round by the Atlanta Hawks in 1983, but was cut as the Hawks also drafted Doc Rivers and Randy Wittman ahead of him. 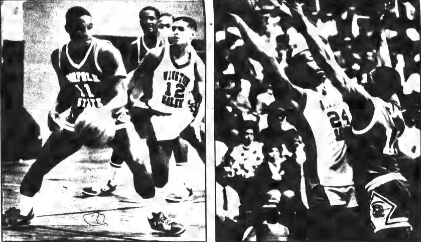 Like Kelly, Lee was a scoring machine playing for Clark in the mid-1980s. The California native was a prep sensation out of Sacramento, but his grades kept the big-time schools away. He was discovered by a Clark College assistant at a playground and ended up in the AUC. The high-flying guard led Division II in scoring three straight seasons (85-87), finishing with 3,298 points, fourth highest in college basketball history at the time. Despite those gaudy stats, the 6’3 forward went undrafted in 1987 at a time when Charles Oakley had just been taken in the first round by the Chicago Bulls two years prior. Lee would go on to play pro ball over in Europe before committing suicide in 1994. The CIAA has seen a lot of great guards come through its ranks throughout the decades. Sam Jones in the 1950s, Cleo Hill and Earl Monroe in the 1960s…the list goes on. But if you talk to the old heads, nobody this side of Earl Monroe was as devastating a scorer as Ralph Tally. A four-time All-CIAA player, Tally had the ability to take over the game from the perimeter back before a lot of guards were doing it. He also had legendary battles with Virginia Union, going at it with future NBA guard A.J. English and throwing down a dunk over Charles Oakley in the Norfolk Scope at the CIAA Tournament in a game that they are still talking about. He averaged 28.5 points per game as a senior in 1986-87 en route to being named the Division II Player of The Year. Tally would be selected by the Lakers in the fourth round that year, but never made a regular season appearance as he was cut just before training camp.